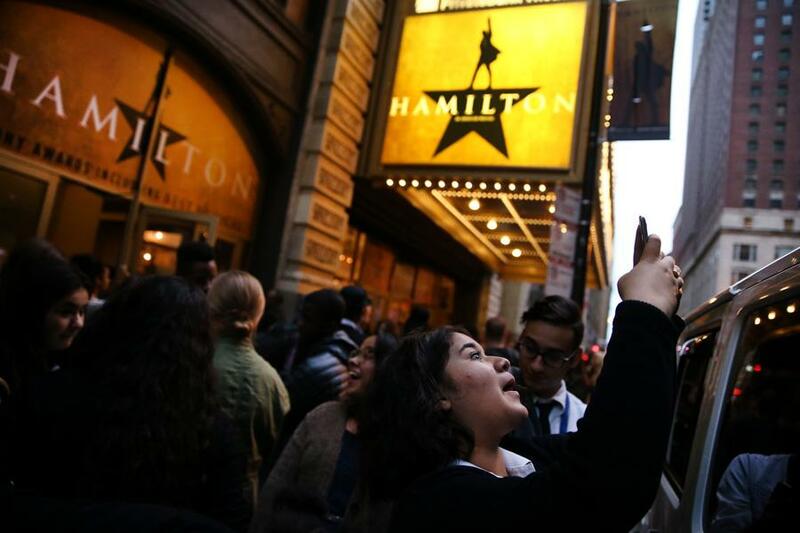 Diana Andrade, 17, takes a photograph outside the PrivateBank Theatre where "Hamilton" made its Chicago premiere in October. The entire incoming first-year class will receive free tickets to see “Hamilton” in Chicago as part of Northwestern’s One Book One Northwestern program, the University announced Tuesday. The entire incoming first-year class will receive free tickets to see “Hamilton” in Chicago as part of Northwestern’s One Book One Northwestern program, the University announced Tuesday. According to a news release, the class — which has approximately 1,900 students — will be split in half to attend two showings of the musical. The first half will attend a matinee performance Oct. 4 and the second half will attend a matinee Oct. 11, the release said. Written and composed by Lin-Manuel Miranda, the award-winning musical combines hip-hop music, dance and dynamic storytelling to narrate the life of Alexander Hamilton, one of America’s founding fathers. According to the release, all students in the incoming class will receive a copy of “Our Declaration: A Reading of the Declaration of Independence in Defense of Equality” by Danielle Allen. The book re-examines the Declaration of Independence and argues that liberty and equality are interdependent, the release said.